The LG Optimus L7 is a well designed phone with a good display but it offers sluggish performance. The LG Optimus L7 may be cheap but it certainly doesn't look so. It's one of three new LG smartphones (the others are the Optimus L5 and Optimus L3) the company has categorised under the term "L-Style". The Optimus L7 has a modern, square-style case with curved sides, a flat top edge and a silver trim that surrounds the whole edge of the handset. The look doesn't exactly stand out in a crowd, but the styling is distinctive. There are a couple of design touches we really like. The textured pattern on the rear cover of the Optimus L7 makes the phone comfortable to grip, the faux, brushed aluminium look on the panel surrounding the camera lens matches the look of the silver trim and the physical home button provides good tactility. The Optimus L7 feels well constructed and there's no sign of creaks or rattles even when force is applied to the case. The Optimus L7's battery cover is annoyingly difficult to remove since there's no slot for your fingernail to pry it open. Once you do get it off you can access the full-sized SIM card slot and a microSD card slot without removing the battery. The position of the speaker on the back, towards the bottom left corner, is a poor design decision. The sound is muffled and the volume is significantly lowered when holding the phone in your right hand. The speaker sounds poor enough on its own, so it didn't need any more hindrances. There are a few other annoyances, too. The Optimus L7's power button is hard to reach when you're holding the phone single-handedly due to the squared design, and the volume buttons could have been raised from the edge of the surface to make them more comfortable to press. On a positive note, these buttons aren't easy to accidentally bump like many other Android phones. The LG Optimus L7 has a fairly large 4.3in IPS screen with a resolution of 800x480. The display has excellent viewing angles and vibrant colours. It can't display the same crisp text as more expensive smartphones but considering its low price tag, the L7's screen is hardly a negative. In fact, it's one of the better smartphone screens we've seen in this price range. Unfortunately, the screen isn't as bright as many other smartphones on the market, even when turned up to its highest level. Annoyingly, there is no ambient light sensor to automatically adjust the brightness so this needs to be set manually. You can add a brightness toggle (low, medium, high) in LG's convenient quick settings menu, but the lack of an automatic brightness setting is a real downside. The LG Optimus L7 runs the 4.0 Ice Cream Sandwich version of Google's Android platform, but is skinned with LG's own user interface. The good news is that this interface overlay adds some new features that most people will actually use. Swipe down the notification bar, for example, and you'll get quick access to four completely customisable toggles called quick settings. You can add and edit a range of toggles here including QuickMemo, Wi-Fi, Bluetooth, sound profiles and screen brightness. It's a nifty inclusion and definitely adds value to the standard notification pull down. The lock screen on the Optimus L7 is also worth mentioning. When you put your finger on the screen to swipe and unlock it, a circle appears and gradually gets larger as you swipe. The circle is translucent and reveals the screen you're swiping into. It doesn't add any real functionality, but it looks impressive. You can choose one of three different clock widgets to display on the lock screen, but you can't swipe directly into any apps. Although LG's skin on the Optimus L7 adds some functionality, we aren't a fan of its look and feel. It strays away from Android's standard roboto font and dark, Tron-like colours. There's definitely evidence of the stock Ice Cream Sandwich user interface in some apps. The contacts menu, for example, looks very similar to Google's stock version, while the music player shows evidence of stock ICS. Most other apps are an assortment of lighter colours and cartoon-like icons that aren't particularly attractive. Optus pre-loads the Optimus L7 with no less than 17 apps in the app drawer, most of which you'll never use. Some of these are merely links to Web pages, while others like the Optus Smart Safe service are dedicated applications. Either way, the bloatware is way over the top, even if most of these apps are removable. A bigger issue than the look and feel of LG's interface is the performance of the Optimus L7, which is simply below par. To put it simply, this is a slow and sluggish smartphone to use. Lag is apparent in even basic tasks, like swiping to unlock the screen, swiping through home screens and opening apps. Paying anything more than basic games, like Angry Birds or Temple Run, is virtually impossible due to the low frame rate. We weren't expecting the Optimus L7 to offer performance comparable to flagship smartphones, but the poor performance isn't acceptable. Even taking into account the relatively competitive price tag, it's clear the 1GHz single-core processor and a modest 512MB of RAM don't provide enough grunt to offer a satisfactory user experience. The LG Optimus L7 has a 5-megapixel camera with single LED flash. It captures reasonable photos and we were particularly impressed its tendency to naturally replicate colours. Excessive image noise and a lack of detail are both significant issues, though, and the LED flash does little to aid poor low light performance. Video quality is poor by comparison. The Optimus L7 lacks HD recording, so the best you'll get here is low quality VGA recordings that struggle to remain in focus with even slight movement. The Optimus L7 comes with just 4GB of internal memory, but only 2.72GB of that space is accessible to the user. If you use your phone to listen to music and store a few videos, this memory will quickly fill up. We recommend purchasing a microSD card as LG does not include one in the sales package. One positive of the LG Optimus L7 is its 1700mAH battery which modest users will have no problems pushing through a full day of use. LG's power saver feature also aids battery life. When switched on it can be set to turn off known battery draining features like Wi-Fi, Bluetooth and auto-sync, and can tone down other settings like screen brightness, screen timeout and the shortcut key lights. 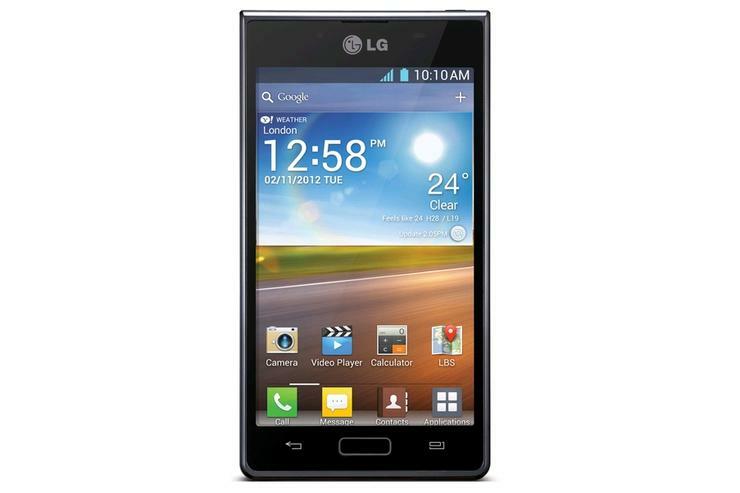 The LG Optimus L7 is available now for $269 outright or on various contract plans through Optus and Allphones.